This list is not definitive. For a fuller appreciation, download and test the installation without obligation. SportsTrak is an interactive database of students, teams, events, and scoring system woven into a well structured package offering flexibility, versatility, and reliability. Setup wizards provided to guide the setting up of each carnival. Each carnival is set up in its own folder (e.g. Aths2009; Aths2010, etc.) 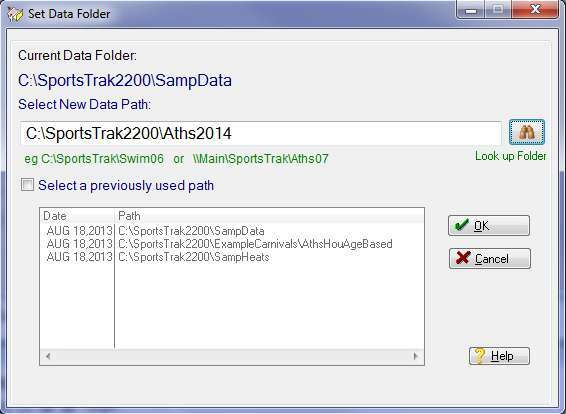 and are accessed by changing SportsTrak's data path. So you can work on any number of carnivals at once, by switching between them..
Student data is able to be imported from a text file or from Excel with data from a student database or can be manually entered. 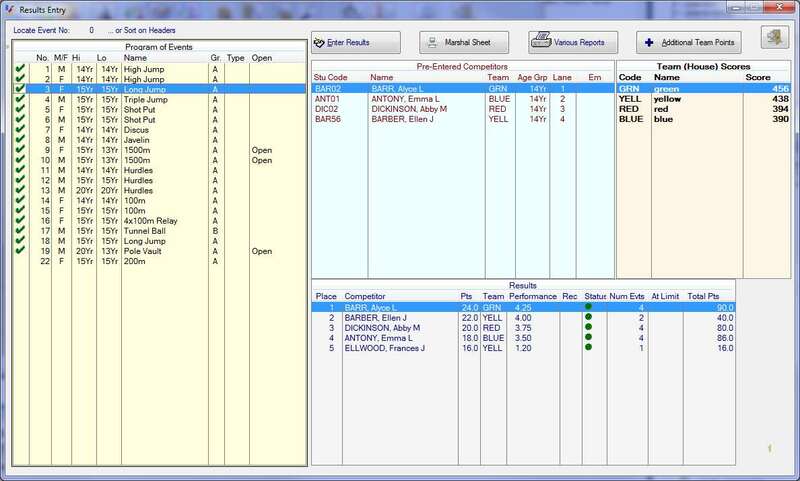 A student's Age Group is automatically determined, based on a date set by the coordinator. If Year level data is entered then students may be promoted at end of year. Unlimited number of teams or houses. A carnival is based on either Age Groups or Year Levels. Usually, the entire program is based predominantly on Normal or Standards, but they can be mixed. Points accrued go to Teams and to the Individuals, thus determining Team and Individual Championships and placings. 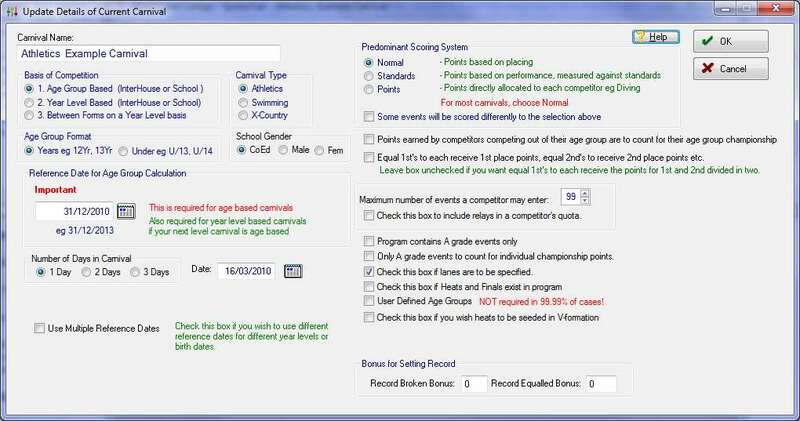 Scoring system may be changed and all scores recalculated any time during or after carnival. Sub-divisions within the overall championship can be set by the user. E.g. you may want a Junior Championship based on all 12Yr and 13Yr scores of both Genders. Automatic or Manual Sorting of placings. 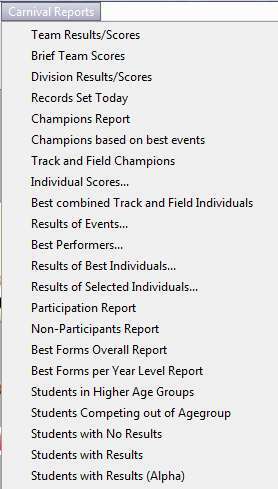 Results may be recorded by entering competitors' performances and having SportsTrak sort them into placings. Sorting can be automatic or on demand. Alternatively, places and as few or as many performances as you consider important may be recorded. Lanes may be specified for all teams in all events. 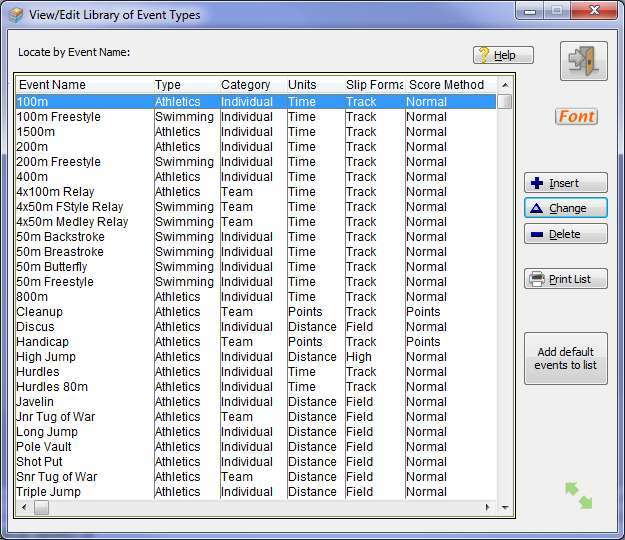 Lanes can be set fixed or rotating for any number of events and manually over-ridden. A - The final stores all heat results and processes them all based on their heat times. 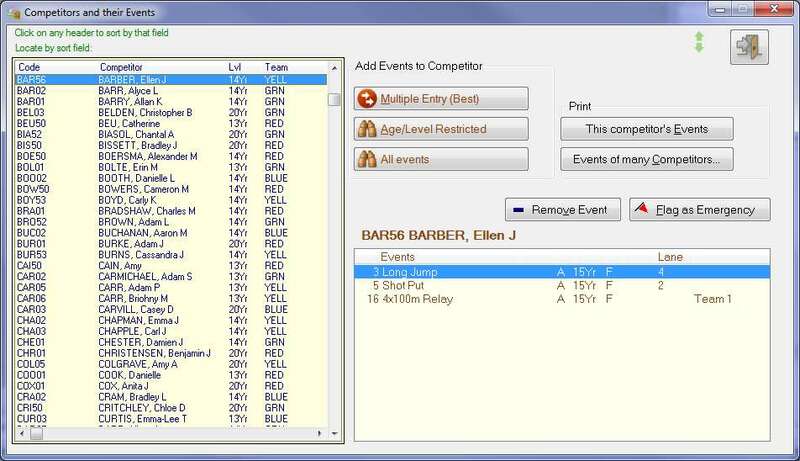 Finalists can be seeded into lanes based on team Lanes or in a VEE formation with best heat result in Lane 5, etc. Competitors may be pre-entered into events, for printing on program and marshalling slips. 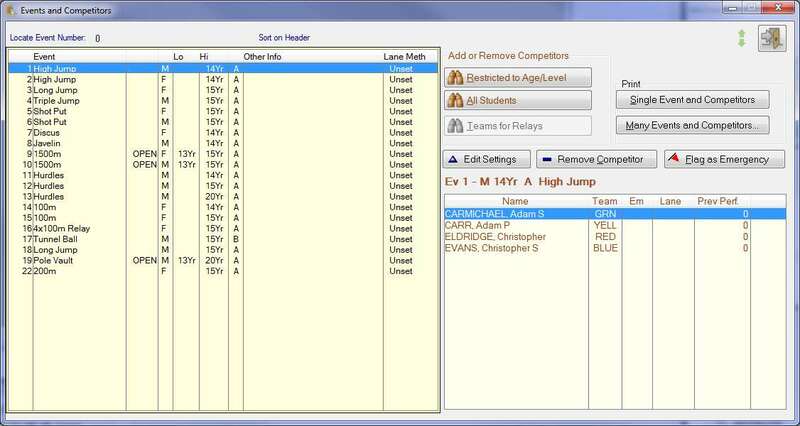 Team Members can be entered in Relays for printing on a specific Relay Members Report. Team Results can be saved. 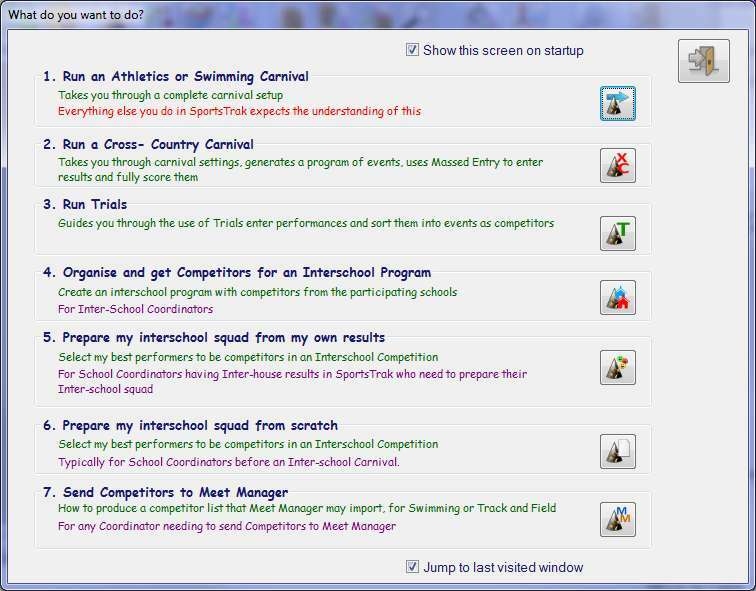 Massed entry mode for Trials and Cross-Country allows all students to have a performance recorded for them in any number of event types, without having to call up an event number. 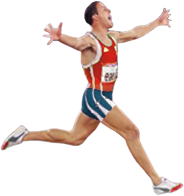 Easily Publish to a Website: the program, competitors, records, results etc. Export best performing competitors for import into another carnival, e.g. export best performers from a House carnival, and import them into an Inter-School program, into the appropriate events. Archive feature allows whole carnivals, or partially set-up carnivals to be saved and retrieved.